Menulog delivers for Tang Dynasty Restaurant so you'll be able to track your courier on a map. Succulent Australian king prawns, juicy Canadian scallops and tender New Zealand ling fish fillets tossed with crunchy snow peas. Pan-seared juicy Canadian scallops with snow peas in chef’s housemade XO chilli sauce. A traditional and popular crispy shredded chicken dish with fresh chilli and minced garlic bathed in our chef’s special shantung sauce. Pan-fried Australian premium wagyu beef striploin MBS5+ served with chef’s special wasabi sauce. Australian grass-fed beef tenderloin wok-tossed with black peppercorn, onion and capsicum. Szechuan style air-fried crispy duck marinated with chef's special spice and served with cucumber, shallots, imperial peking sauce and 8 steamed crepes. Stir-fried tofu puffs with mushrooms coupled with broccoli. Roasted duck topped with shiitake mushrooms and surrounded with green vegetables. 1st course: Our renowned peking duck roasted to perfection and served with a range of fine accompaniments, hand-rolled pancakes (16 pcs), slivers of fresh cucumber, shallots and the luxurious imperial peking sauce. 2nd course: Duck san choy bao. Shredded flash-fried Australian grass-fed topside steak with a sweet ginger sauce. Australian lobster tail gently sautéed and served with our spicy szechuan sauce. Our renowned peking duck roasted to perfection and served with a range of fine accompaniments, hand-rolled pancakes (16 pcs), slivers of fresh cucumber, shallots and the luxurious imperial peking sauce. Tang Dynasty’s famous roasted lamb baby ribs topped with our chef’s special shantung sauce. Deep fried Australian jumbo king prawns wok-tossed with fresh red chilli and spring onion. An airy and fragile confection created from the costliest ingredients. Our peking chef transforms the inner hearts of the finest seafood scallops into a thousand slices, finer than a mermaid’s golden tresses served crispy deep fried on a feather soft bed of savoury Chinese broccoli leaf sprinkled and enhanced with some delectable sugared Chinese walnuts and dry cranberries. Pan-seared scallops with housemade XO chilli sauce. Housemade deep fried spring rolls. Served with a tangy sweet and sour vinaigrette or peking duck sauce for duck spring rolls. A mixture of finely chopped fresh vegetables wrapped in crisp iceberg lettuce cups. A mixture of minced seafood with finely chopped fresh vegetables and wrapped in crisp iceberg lettuce cups. A mixture of minced chicken with finely chopped fresh vegetables and wrapped in crisp iceberg lettuce cups. Deep fried fresh tofu wrapped with golden skin and flavoured with fresh red chilli, spring onion and coriander. Homemade deep fried curry puffs stuffed with Australian minced fresh vegetables. Steamed buns in mushroom shape stuffed with shitake mushroom. Boiled wonton with pork and Chinese vegetable fillings dressed in chef’s special red chilli sauce. Steamed silken tofu with fresh red chilli and minced garlic in homemade spicy and sour sauce. Homemade deep fried curry puffs stuffed with Australian minced beef and fresh vegetables. Deep fried eggplant topped with house special sweet and spicy sauce. 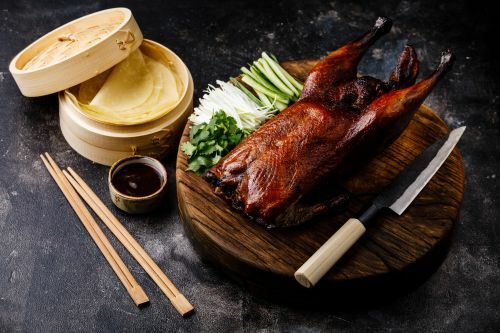 Our renowned peking duck roasted to perfection and served with a range of fine accompaniments, hand-rolled pancakes, slivers of fresh cucumber, shallots and the luxurious imperial peking sauce. 1st Course: Our renowned peking duck roasted to perfection and served with a range of fine accompaniments, hand-rolled pancakes (16 pcs), slivers of fresh cucumber, shallots and the luxurious imperial peking sauce. 2nd Course: Duck san choy bao. 3rd Course: Homemade duck bone soup with seasonal vegetables and tofu. Australian grass-fed beef tenderloin wok-tossed with black pepper and onion. Pan-fried Australian premium wagyu beef striploin MBS5+. Served with chef’s special wasabi sauce. Szechuan-style water-boiled Australian grass-fed beef tenderloin bathed in hot and red broth bedded with vegetables. A Mongolian dish of tender lamb fillet and succulent shallot pieces transformed by our peking chef into a true classical dish. This was one of the favourite dishes in the courts of Ching Dynasty. Traditional spicy szechuan dish. Diced supreme chicken Maryland fillets sautéed in garlic, shallots, chilli, aged vinegar and accompanied with roasted nuts and garlic stems. Crispy chicken breast fillet topped with chef's special honey sauce. Crispy chicken breast fillet topped with chef's special lemon sauce. A chicken seasoned with a quartet of Chinese pickled vegetables, shredded port fillets, mushrooms and five spice. Marinated overnight then wrapped in a lotus leaf and bread dough and baked in an oven for five hours. (48 hours pre-order and deposit required. Please ask our friendly staff for details). Deep fried tender chicken breast fillet pieces with our chef’s special imperial peking sauce. A traditional tender and juicy pork dish coupled with chef’s special peking sauce. Spicy seared double-cooked pork belly wok-tossed with leeks. Deep fried pork pieces flavoured with our homemade sweet and sour sauce coupled with pineapples, green and red bell pepper. Indulgent deep fried pork chops. Served with red chilli and spring onions. Stir-fried shredded pork fillet in homemade peking sauce and served with steamed crepes (6 pcs). Succulent Australian king prawns, juicy Canadian scallops and tender New Zealand ling fish fillets tossed in crunchy snow peas. Stir-fried juicy Canadian scallops with snow peas in chef’s special XO chilli sauce. Stir-fried Canadian scallops with ginger and shallots. Deep fried Australian king prawns battered with honey and a sprinkling of sesame seeds. Stir-fried Australian king prawns with garlic and onion. Deep fried Australian lobster tail wok-tossed with red chilli and spring onion. Wild New Zealand ling fish in spicy sour soup with pickled cabbage. Deep fried Australian calamari wok-tossed with fresh red chilli and spring onion. Steamed ocean perch with chilli, garlic, ginger and soy sauce. Stir-fried asparagus with snow peas and minced garlic. Szechuan style fresh handpicked green beans in chef’s housemade XO sauce. Boiled Chinese cabbage soaked in housemade special fish broth. Stir-fried lotus roots with snow peas, black fungus and carrot. Boiled Chinese cabbage soaked in housemade special creamed sauce. Tofu patties stuffed with minced Australian prawns and fish paste flavoured with coriander and shallots served with house special sauce. Stir-fried tofu with minced beef in house special szechuan chilli sauce topped with shallots. (Please advise your spice tolerance level). Deep fried fresh tofu wrapped with golden skin and flavoured with red chilli and spring onion. Pork and prawn wonton with egg noodle. Pork and prawn wonton soup. A classical Chinese soup with Australian prawn meat, tofu, black fungus and shallots flavoured with chilli sauce and aged vinegar. Szechuan style noodle with chilled vegetables and garlic in spicy and sour aromatic sauce. Cantonese style noodle with combination of scallop, fish fillet, prawn and vegetables in chef’s special XO sauce. Cantonese style noodle with combination of beef, chicken, pork and vegetables. Deed fried purple sweet potato puffs. Boiled wonton with pork and Chinese vegetable fillings dressed in chef’s special red chilli sauce. May contains seafood.